Build a Trellis: Using sturdy materials like a wooden frame with lattice attached, it is possible to fashion a trellis for climbing vines. Trellis is a nice way of filling empty space on a wall. You can place your planter pots at the base, making sure you have waterproof pots and the right type of vine. Pothos (Devil’s Ivy) is one of the best for growing indoors with medium light requirements. Don’t let this dry out. Use Industrial ‘leftovers’: The current ‘in thing’ is the industrial look. 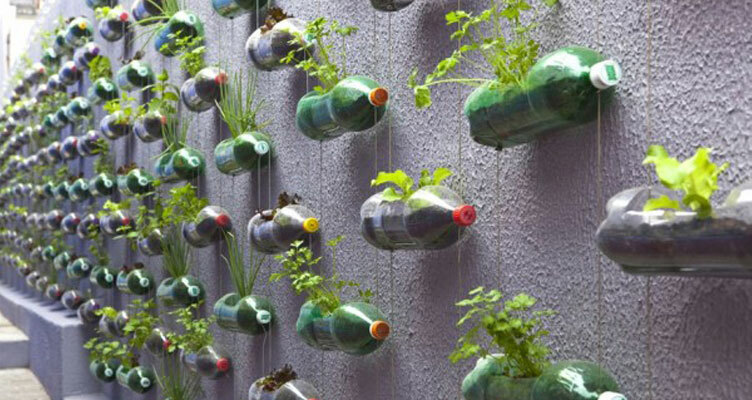 Use various materials to come up with vertical gardens such as bricks, wooden pallets, rain gutters, metal buckets and cans and anything else that will give an interesting look to the wall. Some of these are available at local hardware stores, but most homes will have some of this just lying around. Remember, it’s a good idea to install waterproof pots into these materials so that you won’t have leaks and the plants are easy to replace if they get sick. Planting directly into metal can also cause rust. These will make very creative vertical planters. Baskets: You can dangle small containers like baskets anywhere and bring greenery to your surroundings. On a balcony, you can combine herbs with colorful annual flowers for planting that would look aesthetically bold. Indoors, try to use some colourful foliage but remember, the brighter the colour of the foliage usually means the more light the plant will need to ensure it stays healthy. Fence Palings: Any office can try this form of vertical gardening. Just hang a few fence palings along a wall in any pattern. Thinner palings might need to have two together. You could even make them into the shape of a ladder. Attach any number of baskets or cans (decorative planters) to them with wire or cable ties so that they are attached at the back of the pot (out of sight). You can then insert your waterproof pots inside these outer ‘decorative planters). Cover the top with coconut fibre so the internal pot can’t be seen. Don’t have your pots at too much of an angle as the water will all be on one side only and half the plant’s roots will dry out. 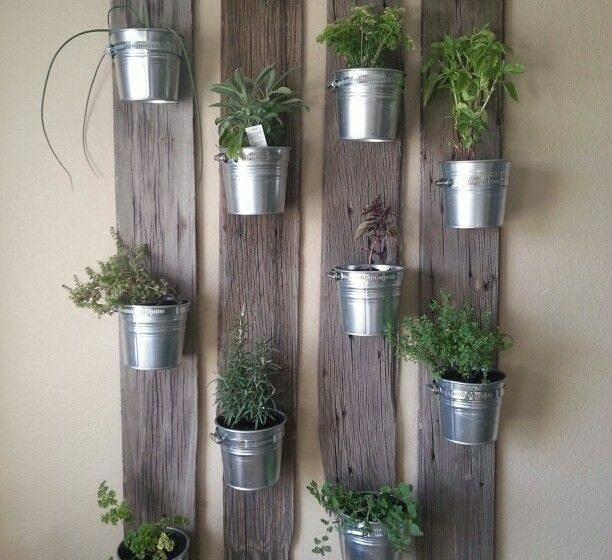 Also use a hayrack or other farm equipment for hanging these pots. Re-use a Rack: Don’t throw out your old dishwashing rack, shoe rack or wire fencing. This is all the rave now. Keep these to hang on your wall with small planter pots attached. Always use waterproof pots and if these don’t have hanging cable/chain, make holes in the top of the pots to allow you to hang them. You can simply lean the rack against an outside wall or you can mount it. Vertical Pallet Herb Garden: A free-standing vertical garden can be crafted using leftover wooden shipping pallets. Wash your pallet with bleach and sand it down, then add a wood frame at the bottom and under each horizontal frame to hold the pots. You can leave it natural or stain the wood and insert small pots or attach larger ones with cable tie or wire. For indoors, make sure you use waterproof pots. The sky is the limit when it comes to designing your own vertical garden or green wall, based on your choice and the available materials. 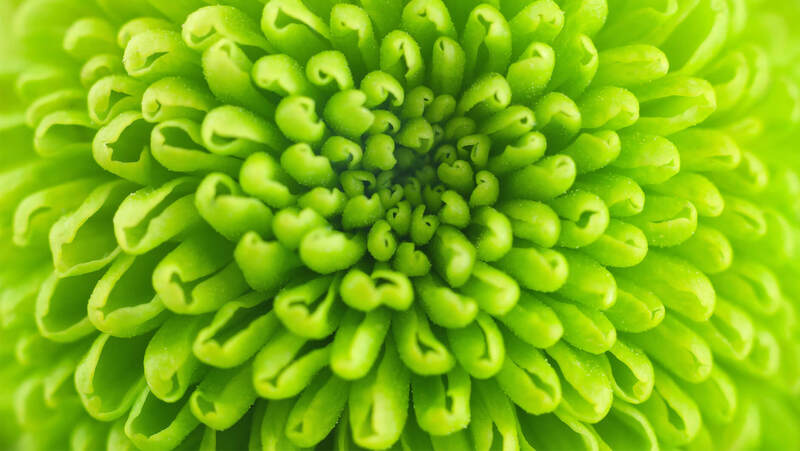 However, setting up your plants and maintaining them can be daunting, so why not contact an Indoor Plant Hire Company? They can set up all the plants and maintain them so you don’t need to do a thing, yet your plants will always look healthy and vibrant. Enjoy your new Vertical Garden!